What is the difference between business registration and business certification? Hąą’aatíʼsh bee eł’ąą’átee’ díʼbusiness registration dóó business certification wóól’ye’hiigíʼ? Registering your business is not optional whereas certification is optional. When you register your business, you are establishing your business presence in the eyes of local and State governance. Certification, on the other hand, is a process you go through in order to qualify your business to various institutions. There are many types of business certification. On this website, we only cover Navajo Preference Certification. What type of business should I start? Hąą’léé tee’hiigíʼ shanaa’iiniihii daa’biidiishwóół lá? If you’re setting up or thinking about a brand new business, you must first decide on the type of business to start. This decision determines how much you pay in taxes, the amount of paperwork you will manage annually, and the personal liability you face. The structure of your business – a Limited Liability Company, a C-Corp or S-Corp, a sole proprietorship, or Partnership – depends on the nature of your business and your vision. Generally, a sole-proprietorship is the most simple and most common way to operate a small business. Visit the Business Structures page to learn more about the differences, pros, and cons of different business identities. Do I need to hire a lawyer to prepare my documents or do my taxes? Á’ghąą’díʼtá’híʼsh níʼsiin díʼnaalstoos hąądiish’łehíʼbiinii’yee? No, legal counsel is not a requirement to complete the documents for registration or for Navajo Preference certification. If you have questions about completing the forms, you can get advice from legal council or your local RBDO. Similarly, an accountant is not required to file your tax forms on the Navajo Nation. Are the processes the same for Non-Navajos? Dóó Diné daanlíʼniigíʼ eííhąątíʼleegó eíísh a’ąąkhełteego baa’aahóótíʼ? The forms are the same regardless of race. However, eligibility for Navajo Preference Certification is limited to Navajo owned companies. Similarly, a registered agent with an address on the Navajo Nation is required to register any business on the Navajo Nation. Who prepared the information on this website? The information on this website was researched by Catapult Design, a Navajo-led non-profit organization, with input from Western RBDO. We created this resource because we hoped that access to this information would help address common questions about starting a business on the Navajo Nation and eventually lead to more Navajo-owned businesses operating on the reservation. We will continue to edit and expand on Build Navajo. If you would like to keep up-to-date on the site or have a question to submit, please use the form in the footer at the bottom of this page. What does it mean to register my business on the Navajo Nation? Hąą’íʼsh áahíʼłníʼ sha’naiiniihiigii díʼDiné Bikéyah bináhásdzóó bíʼtáa’hiigíʼ hąątíʼsh łee’góó? If you have an existing business on the Navajo Nation that is registered in a US State, you can register on the Navajo Nation as a foreign-based business. Once registered you become liable for local taxes for all transactions on the Navajo Nation and are able to apply for permits and certifications (if eligible) regardless of whether or not you or your business reside within the Navajo Nation. If you have an idea for a business and have not registered your business within a US State, you can register on the Navajo Nation as a domestic-based business. Alternatively, you can register first in a US State and then with the Navajo Nation as a foreign-based business. Regardless, registering your business is required for all businesses in the US as well as on the Navajo Nation. When you register you become recognized as an official business that pays taxes, can apply for a loan, apply for various certifications, etc. In order to register your business, you must have all of your organizing documents in order, which may include: Articles of Incorporation, a business plan, Bylaws, and so on. Your organizing documents are dependent on the type of business you want to start: a C-Corp, an L3C, a sole proprietorship, etc. If you need help with these decisions, please visit the Business Structures page. Why should I register my buisiness on the Navajo Nation? Hąą’íʼsh biinyee Diné Bikéyah bináhásdzóó bikáaʼjí’ sha’naaiiniihiigii ashłeíígóó shá’ya’teeh? Any operating business where transactions are made should be registered. However, a large percentage of the economy on the Navajo Nation consists of unregistered businesses, also known as the “informal economy.” In order to apply for a business loan at a bank or CDFI to grow your business, if you need to rent or lease space for your business, or if you plan to hire staff and claim them as employees, you will need to register your business. Is there any disadvantage to registering with the Navajo Nation vs. a US State? Diné Bikéyah bináhásdzóójíʼ hąązhtíʼleíí’ góósh ya’teeh, doodááí’ dáatsíʼ Wááshindoonjii bił’hąądaahóódzóóíʼgíʼ eííjíʼgóó dátsíʼ ya’teeh? No, there is no disadvantage. However, if you choose to register a new business with the Navajo Nation as a domestic-based business (meaning you are not registered in a US State), you are advised to still register your business name with the US State you live in. This will help if and when you apply for a business loan at a bank. How long does business registration take? Business registration jíʼhąązh’dí’leegóó, eíísh khąąląąnzaa’góó bí’ghąą’á’le? From the time you submit your forms to Navajo Tax Commission and/or Navajo Business Regulatory, you should receive confirmation of registration within a few weeks. To get instructions and a list of the forms you need to submit, click on Start my Business. Do I have to re-apply for registration every year? Táa’náá’hąąií’sh hąątí’shí’ dóó? Yes, you will need to submit a form annually confirming that your business is still in operation. You will not, however, need to re-apply from scratch. Do I need to be based on the Navajo Nation in order to be eligible for Navajo Preference Certification? Diné Bikéyah bináhásdzóó bikáaʼgí’shiiłhaazáágóósh deííyaa, Navajo Preference Certification sháábeelaa’á’ dóóleeł? No, you do not need to be based on the Navajo Reservation in order to be eligible for Navajo Preference Certification. What is Navajo Preference Certification? Navajo Preference Certification eíísh hąą’tí’ óólyee? The Navajo Business Opportunity Act gives certified Navajo-owned businesses the first opportunity to bid on projects. Businesses get certified according to the following classification system: Priority #1 and Priority #2. The Navajo Nation government created Navajo Preference Certification to benefit Navajo-owned and Native American-owned businesses and therefore only businesses that meet the criteria are eligible. Navajo Preference Certification is not a requirement for your business, however if you are eligible and intend to bid on contracts with the Navajo Nation government it is highly recommended. After your initial certification, you will need to recertify your business annually. How long does Navajo Preference Certification take? Navajo Preference Certification jí’kąązh’di’leíígóó, khąąláán záá’góó bí’ghąą’ á’lee? Approximately one month from when you submit your application. However, there can be longer wait times during the holidays. 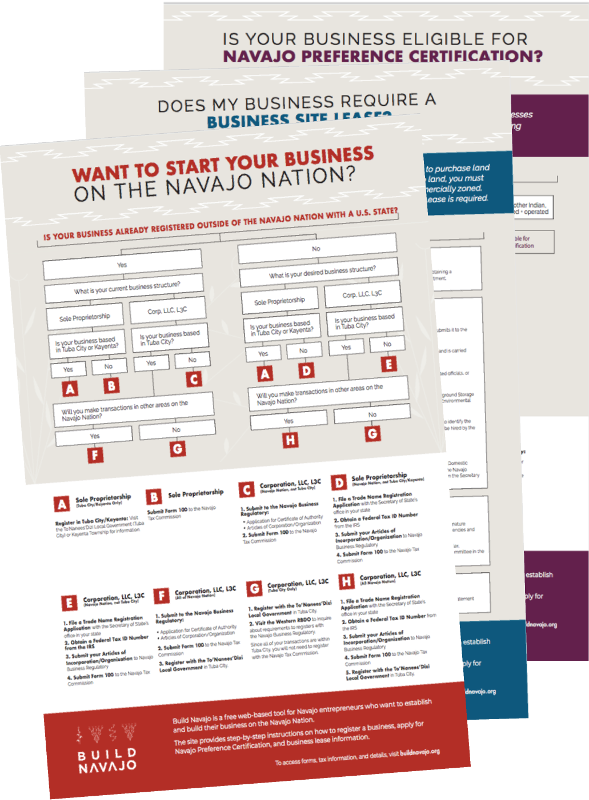 Visit the Start Your Business section to take the eligibility quiz and download the instructions and forms to apply for Navajo Preference Certification. What is a Business Site Lease? Business Site Lease lá’hąą’í’ óólyee? Because the Navajo Nation is sovereign, individuals and companies are not allowed to purchase land on the reservation. Therefore if you want to maintain a physical structure on Navajo land you must either apply for a Business Site Lease or use an existing Industrial Site that is commercially zoned. There are seven RBDOs (Regional Business Development Offices) dotted around the Navajo Nation that specialize in assisting new business owners in getting a Business Site Lease or an Industrial Site Lease. Visit your nearest RBDO to start the process. While the process requires multiple agencies to sign off on documentation, your local RBDO will help manage the majority of the process for you. Please note that a Business Site Lease can take as little as 3 months and as long as many years. The timeline is dependent on a variety of factors, including how busy your local RBDO is and how quickly a Chapter Resolution can be approved by your local governing Chapter. When it comes to the Business Site Leasing process, patience is a virtue. Do I need a Business Site Lease for my bed and breakfast (B&B) or other home-based business? Táá shiihooghaan dóó shanaaiiniihóó, doodááí’, eííshighaan bii’dáázhní’jáágóó í’shłą́agóó eíísh eííBusiness Site License ní’siin? If you plan to run a business from your home on the Navajo Nation, depending on the nature of your business (web-based vs. consulting vs. retail) you may be required to convert your Home Site Lease to a Business Site Lease. Visit your local RBDO to determine whether the nature of your business requires a business site lease. If I apply for a Business Site Lease, will I get one? Business Site Lease bí’niiyeeh hąątí’sh łą́agóó, eíísh shá’beela’á’ dooleeł? It’s not a guarantee that you will receive your Business Site Lease if you apply for one. However, a representative at the Western RBDO estimates that 90% of people who apply for a Business Site Lease get it. How long does it take to get a Business Site Lease? Business Site Lease jí’ghąązh’di’leíígóó, ghąą’łą́an za’góó bí’ghąą á’le ghąą’bee’lá’ą́ lee’jí’? View the Business Site Lease poster to understand the steps you go through to apply for a Business Site Lease. The time required for each step varies. For example, you will need a Chapter Resolution, which can go slowly or quickly depending on how busy your local Chapter is. The Navajo Nation government estimates that completing all of the steps can take less than one year. However, in interviewing entrepreneurs for this website, we encountered some who waited more than one year. Where do I go for more information on cost, survey vendors, and so on? Hąądiila’ eííbáán dáaí’niihiigí’ bí’naají’ éhdááhóó’ziiniigí’ doodááí’ hąątídá dikwiibaahdaaí’ liinigii doodááí’ yaadáá’hąąłneeí’gí’ bí’ł hąązáá? The cost required to get a Business Site Lease varies based on the location you have in mind for your business. For example, existing sites may not require new assessments but a brand new site will have to go through every step in the process. Your local RBDO is the government entity responsible for issuing Business Site Leases. Visit your RBDO to learn about existing available sites as well as discuss the costs associated with a new site. Your RBDO will likely manage assessment vendors for you and in some cases, help cover costs. Does your local Chapter need a Build Navajo poster for local business owners? Download, print and post or clip a copy out of the Navajo Times. Disclaimer: The information and materials on this site are provided for general informational purposes only and are not intended to be legal advice. Attorneys did not prepare the content. The processes outlined here are subject to change and there is no guarantee that information contained herein is accurate, complete, or up-to-date. Nothing contained in this site is intended to substitute for the advice of an attorney. If you require advice on the content of this site, please visit your local RBDO. If you require legal advice, please consult with an attorney licensed to practice in your jurisdiction.